ACHESON AUTO WORKS OPERATES IN DES MOINES, IOWA SINCE 1947 AS A "ONE STOP SHOP" AUTOMOTIVE SERVICE & COLLISION REPAIR CENTER TO MEET ALL YOUR AUTOMOTIVE NEEDS! WE PROMISE TO DO OUR BEST FOR YOU! Hello! Thank you very much for checking out the Acheson Auto Works website. We know you're busy so we've simplified our website and condensed the information. Please take a few seconds to see if we are the type of auto repair firm that YOU would trust with your car. Acheson Auto Works was started in 1947 by Sam and Mary Frances Acheson. Still managed by the same family, we pride ourselves in providing our Clients with honest and reliable repairs in a down-home, friendly, family environment. When you call our phone number (515-223-4300) or pull into our drive (8000 University Blvd., Clive, IA) we PROMISE that you will not feel like "just another customer." To the contrary: We know there are dozens of shops from which you can choose, we are flattered and appreciative when you make us your choice. From the beginning of the repair until long after you pull away, you have our commitment that you will be satisfied with all facets of the repair; the cost, the quality, the timeliness and our Staff. Acheson Auto Works has provided motorists in the Clive, IA 50325 area with comprehensive auto repair services that include Brakes, Car & Truck Care, Collision Repair Services, Domestic Cars & Trucks, Electrical Services, Electronic Services, Engine & Transmission, Engine Maintenance, General Services, Heating and Cooling Services, Import Cars & Trucks, Miscellaneous Services, Tires, Towing, Transmission Services and Undercar Services. Our goal is to offer the best services available at affordable prices to get you back on the road in no time. Chances are you're having car problems right now or know someone who is and you're looking for the Best Des Moines Auto Service Center or the Best Des Moines Body Shop. I think we can all agree that the quality of any job is determined by the conscientiousness of the person doing the job. That's why we say, "The Difference Is Our People". Acheson Auto Works - With thousands of trusting Clients in the Central Iowa Area - we look forward to working for you and caring for your car. Please let us know how WE CAN HELP YOU. I needed a last minute oil change and after hearing multiple people talk about Acheson Auto Works on University Blvd I decided to take my car there. I was fit right in and had a very prompt but quality oil change. You cannot get the sincerity or quality anywhere else! 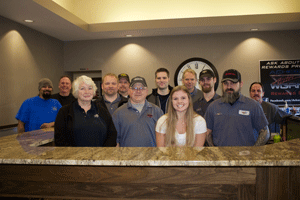 The front desk, young lady, was extremely cheerful and very welcoming. Tim, the service manager, was the exact same. After my oil change they advised me of a small issue I may want to address with my car later on, but did not push or make me believe it is worse than it really is. This is exactly what I want out of an auto service center. Because of their honesty and wonderful atmosphere I will always go back to Acheson Auto Works. After coming to West Des Moines for a funeral, we were about to return home, when we heard an ominous sound coming from the right front wheel. Late that morning, Larry squeezes us in to find the bearing going bad. They managed to repair it and get us back on the road by late afternoon! No more drama on the way home. For travelers far from home, the people at Acheson were marvelous. You definitely lived up to your motto, and we can recommend you highly!!! Great customer service! They listen to your concerns and do everything they can to help you. I went in to get new tires and as they were doing a test drive, they noticed my car was pulling to the right. They took the time to fix that issue quickly. I am very happy with the service I received. I was referred to Acheson by my best friend, who was visiting Des Moines from out of town when her air conditioning broke down in the middle of August. They took great care of her vehicle and offered her family I-Cubs tickets to enhance their visit to Des Moines! My two experiences over the last year have been equally great. They are responsive, kind, honest, and supportive. If they don't fix it, they know who does. Automobile issues are stressful, so finding a repair shop with those qualities makes things easier. Not to mention, they have a great waiting area with free wifi that can be a peaceful break from the office! I won't take my car anywhere else. Thanks again Acheson Auto Works for repairing my Jeep Wrangler. I have never gone through a repair on a vehicle before and the service that Acheson provided was top notch. From the moment i walked in the door Sam Acheson and the staff there made me feel comfortable and assured me my vehicle was in good hands. I hope to not go through any repairs again but if I do, Acheson Auto Works will have my business know questions asked. You guys are the definition of a great a business and I cant say thank you enough! I have always driven very unique cars. Jags, Porsche, ect and I don't like dealing with Dealerships. Sam Acheson Auto Works has always been My "Car Guy." Since 1983. Tires, maintenance, transmissions, interior & exterior work on dozens of automobiles. Always the best...thanks Sam and The Team at Acheson's. Nice waiting room and very clean organized shop. Staff very polite. Fast, Reasonable quality repair. My business for life. Acheson was great to work with after my car accident. The representative was very friendly & thorough with her explanation of the repair process! They were able to get my car in for repair within a few days and the end result was fabulous!!! My car looks good as new!!! I have always found the team at Acheson's to be customer friendly and focused. Work is done right and on time. Whether mechanical or body work, you won't be disappointed. Very Happy with their work, even helped me out on my rental car, would go back for other work. Very good place of business !!!! Thank you to the entire team at Acheson! Great service, caring employees, and willing to go far above what is expected! Customer for life! I took my car in for a dent repair and got it back good as new. All the staffs at Acheson was very professional. They walk me through the shop to show me where my car is going to be and introduce me to the staffs that was going to work on my car. I just want to say that Acheson is awesome! Very rarely do I take time to write a review. However, ... Have taken vehicles to Acheson for many years, now my parents do as well. There are few businesses I deal with that are as enjoyable, professional and as skilled at what they do as the people at Acheson Auto Works. Just one for instance - my recent regular oil change. I forgot to tell them to rotate tires. Was a little stressed when I realized I had forgot. But when I picked up the car, the service guy did a very careful overall inspection and saw the tire ware, rotated the tires - very awesome. Did not just fly through the standard "oil change" and move on to the next task. Added oil/fuel additives that I typically want, but also forgot to ask for (made a point to be awareness of an individual customer's history). Also, more often than not, whoever worked on the car will come out of the shop to talk to you about what was done and possible future issues, if there are any. I have NEVER been to a car Dealership or other automotive shop that willingly has this level of personal c! are and attention. This is low stress car care for me ! This is an outstanding group of people and is one of the things that is special in the Greater Des Moines area. Acheson Auto works/ Sam Acheson has always been a first class place to do business with, an owner that really cares for his customers and employees!! Which is kinda rare these days. This was the BEST experience I have had at the mechanic. The ladies in the office are just fantastic and George is a pleasure to work with. The "waiting" area was more like a living room and just made you feel right at home with fresh coffee and the cheapest vending machine prices in town. I had my six-year-old daughter with me and George had no problem sharing his snacks with her. They promised me quality service, but I got so much more. Real people that just want to help make the experience of going to a mechanic not seem like going to the dentist. Thank you Acheson! Your auto shop is truly one of a kind! Had to bring 2 diffeent cars in. Kim is a 'Rock Star' and all the staff makes you feel like family. Oh, by the way both cars were perfect and finished exactly on time. My car was in an accident and I was looking around at places to get estimates done and I came across Acheson Auto Works. When I walked in, Sam Acheson helped me with writing an estimate for my car. He was very friendly and explained what was going to happen. Even though I received an estimate from them, I decided to go through my insurance because it was going to be cheaper for me to fix my car and the other vehicle in the accident. Acheson Auto Works worked right off the estimate from my insurance company and was able to get my vehicle in within a couple of days. They were able to fix my car in about 3 days and did a fantastic job. Everyone was friendly and very helpful. My experience with Acheson Auto Works has been outstanding. I have only done business with them one time and I can say that they will have my business whether it be for body work or service on my car. I have been a customer of Achesons for over 15 years, during which time I have never not been more than satisfied. Among other hings I have a 17 year old jeep hat no one else had/will ever touch. Betsy (my jeep) has close to 200,000 miles on it and Acheson has performed steady maintainance and full open-heart surgery as was warranted. While the patient (Betsy) is quite geriatric, they have kept it running when by all accounts the steel should be recycled into a corrugated waste basket by now. The prices are reasonable or better than all the others I have periodically checked. With their robust rewards program available at the store and on the internet it seems obvious that Sam (his name is on the door), the owner, is determined keep his old customers happy and his new ones shocked and amazed. There is none of this "now we got you so all our best deals go to new customers" (cable tv are you reading??). In addition to competence and price there are other reasons why I have been a loyal customer. Briefly, they are honesty, courtesy, speed of work, an elegant and comfortable waiting room, and a universally friendly staff. I never left feeling I had been had, even though I am an auto mechanical perpetual neophyte. I have recommended them maybe a dozen times and my friends are now my grateful friends. These people have figured out that you can take care of your customers and still run a flourishing business. If they could bottle their treatment it would be worth buying it. In the meantime, they are good at what they do, and nice while they are doing it. I give this business a maximum rating of five stars. I was a first time customer at Sams about a month ago. I was referred to them by CarX and didn't really know what to expect. Let me tell you that they blew away my expectations! I have been used to other automotive shops in the Des Moines area, but Sams is different. I met with Sam regarding possible frame damage to my vehicle that autocheck was reporting. From the moment I walked in I was greeted, handed a bottle of water, and welcomed like I was family. They were very inviting and professional, which is VERY rare in today's business! Sam took me back to where my vehicle was and took the time to explain to me everything he was inspecting. Within a couple days Sam emailed me a VERY comprehensive report of his findings. This report helped to save me thousands of dollars when I sold my vehicle. I would recommend Acheson auto to anyone that wants a friendly, respectful, and professional auto experience. The only bad thing is there isn't an Acheson auto in every city in America! God bless!! I have nothing but good things to say about this shop. On Sunday, I hit a 40lb turkey or goose going 80mph. I called Brady on Monday, dropped my car off after work on Tuesday, and was able to pick it up Wednesday after work. Not only did they complete the work within a day, with one days notice, but they worked with a local rental car company so I was able to pick it up & drop it back off at the shop for minimal hassle on my end. They cleaned up all my glass and even gave it a little extra cleaning, which is good, because I hadn't vacuumed my car in over a year - I believe. It was almost too easy from start to finish. I wouldn't take my car anywhere else. Also, since the rental car people weren't there to do a walk around, Sam did one with me right there on the spot. The attention you get at Acheson is diamond ratings all around. Thanks again you guys for getting my car back to me so quickly. I want to "Thank You" for the attention your staff gave my Porsche Turbo this past week. I know the word "discriminating" is an understatement of my personality when it comes to taking care of my vehicles, but cars have been my passion/hobby since I was a kid. 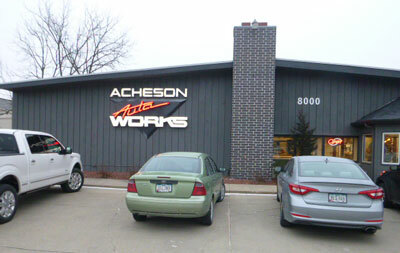 I feel fortunate in that Acheson Auto Works exists in Des Moines and has such talented employees. Your team performed a miraculous job on the recent visit ... please pass on my gratitude to everyone. Last Saturday I started hearing a whirring noise underneath my car. Afraid the bottom would fall out over the weekend, I reluctantly had a competitor perform an inspection. I thought this would give me peace of mind until I could schedule an appointment with George this week. Long story short ... George and your team saved me over $2,000 in unnecessary repairs. The competitor's diagnosis wasn't even correct! Many thanks to everyone at Acheson for your honesty, outstanding customer service and attention to detail. It is always consistent and you've got a customer for life. P.S. I love the new rewards program!